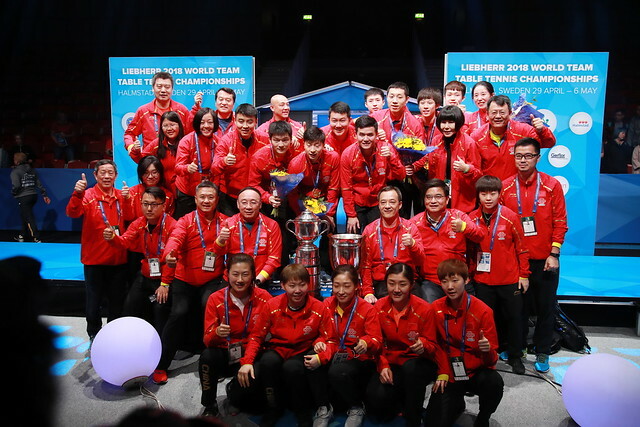 The fate of the teams contesting the Men's Championship Division group stage will be decided on day four of the Liebherr 2018 World Team Table Tennis Championships in Halmstad as the race to reach the top 12 approaches its conclusion on Wednesday 2nd May and one team keen to avoid any late drama is eighth seeds Portugal. With the final round of group stage fixtures to be contested, Portugal could be set for a nervous conclusion to Group B with a top 12 place in the Men’s Championship Division at stake. Despite being seeded 10 position lower than their final group opponents, the Czech Republic heads into the tie against Portugal off the back of two consecutive wins – only one team can progress but who will take the plaudits? India’s hopes of qualifying from Group D received a major boost on day three of play in Halmstad after the team of Sharath Kamal Achanta, Sathiyan Gnanasekaran and Harmeet Desai recovered to beat rivals Croatia by a 3-2 score-line and will look to finish their group campaign on a positive note when they meet face-to-face with Austria while France’s passage to the last 12 is also still up for debate with a defeat against Poland enough to eliminate the fourth seeds. This is the one group which could provide the most drama on day four. Chuang Chih-Yuan’s Chinese Taipei could miss out on a top three spot in Group C if they fail to beat Belarus and England suffers a shock defeat to Belgium. Over in Group A, Hong Kong and Romania will go head-to-head in what is essentially a play-off for third position with Germany and Sweden already through. Over in the Women’s Championship Division all eyes will be firmly focused on the top 12 draw with four spaces in the quarter-finals up for grabs. Runners up in Group D, fourth seeds Hong Kong meet the team seeded one position above them Chinese Taipei in what is expected to be a fierce battle while Singapore takes on Ukraine, who stunned spectators on the last day of the group stage by knocking out Hungary. Both ties will feature at 13.00pm with the winners booking quarter-finals encounters with Romania and Japan respectively. Two further ties will be played out at 16.00pm: Austria looks to extend its promising run of form with a strong display against Germany and on table 2 Russia will fight it out with DPR Korea for place in the last eight. China and Korea Republic await the two successful sides.